Hang in there, Beowulf. Help is on the way . . .
Marc Miller's Traveller is one of the most fully realized game backgrounds ever created . . . a vast empire of over 11,000 systems, with a turbulent history dating back thousands of years. Locales can range from a crowded spaceport to a lonely frontier outpost, from the teeming cities of the Core to the unexplored worlds on the edge of the Great Rift. Characters can be merchant princes, diplomats, soldiers, politicians, nobles, criminals . . . or all of them at once. Political intrigues, trading schemes, mind-wrenching alien enigmas, mercenary raids, wars . . . almost anything is possible. 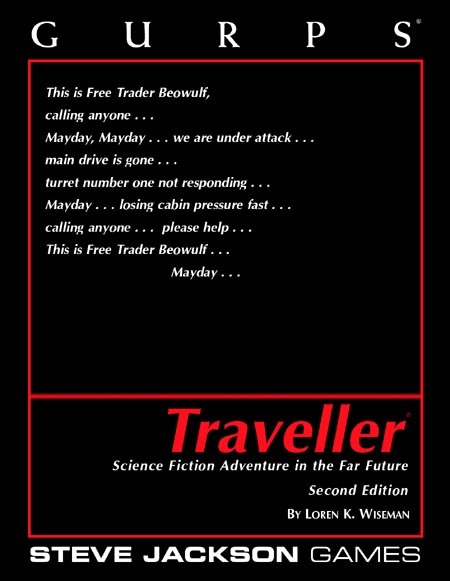 The newly revised GURPS Traveller, Second Edition melds this exciting universe with the rules system of GURPS, and includes rules for creating new characters and for converting old ones from other Traveller rules systems. It includes a modular starship construction system (fully compatible with GURPS Vehicles) and a space combat system for ship-to-ship encounters. 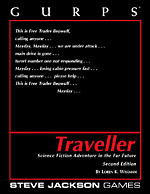 GURPS Traveller also brings you the official alternate universe for Traveller, in which Emperor Strephon, and the Third Imperium, have survived to face new challenges. This book was also released in a Limited Edition Hardcover version.